How to Choose the Best Gas Furnace? How Does a Gas Furnace Heat Your Home? A gas furnace is a forced air home heating unit that produce warm air for your house, and most common in regions of the country that experience temperatures that often drop below freezing. A gas furnace uses natural gas or propane as an energy source. The fuel source is available through a gas main or delivered and stored in onsite tanks. Gas furnaces are considered to be among the most energy efficient home heating systems operating at a 95% energy efficient rate in some models. The cost of a natural gas furnace installation ranges from $2,000 to $3,865. Replacement gas furnace costs will vary depending on the gas furnace brands, type of energy efficiency level, and average gas furnace installation costs in your area. Get exact costs below. You may also be interested in learning about the two other types of furnaces. Compare electric furnace costs, and oil burning furnace costs. Should you repair or replace your broken furnace? Which gas furnace brand is best? 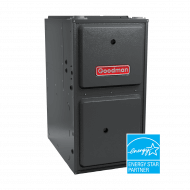 What size gas furnace do you need? What energy efficiency level are you wanting? When deciding to install a new gas furnace you’ll need to decide if it is best to repair your broken furnace or to replace it completely. Here are a few things to check that could mean your furnace just needs a simple repair and will not require a full replacement. Check your circuit breaker box – sometimes power outages can cause your circuit breaker to shut off energy sources to your furnace or there could be issues with your fuses. Check your furnaces air flow – if you are getting low air flow it could be a simple issue with your furnace filter. If your gas furnace filter is clogged it could impact airflow quite a bit. Check your thermostat – your furnace’s thermostat could be malfunctioning or low on battery level. Check for faulty wires around your thermostat as well. See our full list of the best gas furnace brands with cost comparisons, descriptions, and more. When it comes to determining what size gas furnace your home needs, you first need to find out how much energy it will take to warm your home. BTU is the measurement that determines the heat energy output of furnaces. Calculating the size of your gas furnace requires a little more than choosing a small, medium or large unit. On average it takes 30 BTUs for every 1,000 square feet of your home. At the most basic level, if you have a 1,000 square foot house, you’ll look for a furnace that has 30,000 BTU output. What Level of Energy Efficiency Do You Want? Gas furnaces are the most popular home heating choice and fairly affordable in most cases. However, in the long run your energy bills will add up and it’s always smart to opt for an energy efficient gas furnace from the get go. You’ll want to make sure you’re getting a unit with a great AFUE rating (annual fuel utilization efficiency.) A new gas furnaces prices will rise with higher AFUE ratings, but that investment will help save you money longterm. You can install a new furnace with an AFUE rating from a low of 78% to a high of 97%. Do to their ever-advancing technologies; it is easy to get lost in translation when receiving price quotes from gas furnace installers. Asking a furnace installation contractor the right questions is key to purchasing the correct furnace for your home and a quality installation. Ask for several bids from local furnace contractors. Be careful to not always go with the lowest bid, as you could potentially get inferior service and equipment. Ask your furnace contractor to install a new thermostat. Newer technologies require newer devices to run them. Ask for a detailed estimate or proposal that outlines the entire scope of the furnace installation job including equipment manufacturers with model numbers and scheduled completion dates. Ask the contractor to go over your new furnace cost estimate including mathematical calculations used to size the natural gas furnace. Verify that their calculations are correct to avoid buying an undersized or oversized gas furnace. A lot goes into replacing a gas furnace such as selecting the right equipment and choosing the right contractor for the job. Being thorough and doing your homework will increase the chances of a smooth furnace installation or repair. Use this step by step HVAC contractor checklist during your HVAC installation to make things easier on you and also the installer. As the temperature in your home drops below the thermostat temperature setting, the furnace system activates to raise the inside temperature. Once activated, fuel and air combine in the burner where an electronic igniter or pilot light ignites them. The hot gases rise up, through the heat exchanger to heat your home’s air. Gases and exhaust fumes are diverted to the home’s exterior via a furnace flue, or pipe, often through an exterior wall or through the roof. Larger furnaces might incorporate two burner systems to heat larger volumes of air. This would be typical in homes over 2000 square feet or in some commercial buildings. The furnace continues to fire until your home’s temperature rises to the programmed settings on the thermostat after which time it will shut down. When the temperature drops below the thermostat settings again, the furnace system is reactivated and starts the whole process over again. To maintain your gas furnace system and reduce the likelihood of costly repairs in the future, it is recommended that you schedule annual maintenance and cleanings with a certified heating and air contractor. This should be done before the winter season sets in, when HVAC contractors are likely to become busy. This will give you peace of mind and assurance that your system is running at peak efficiency when the cold weather hits. As the fresh air enters the furnace system, it must pass through a filter to remove dirt, dust, dander and other contaminates that could harm the system. The filter is often located within the return vent but sometimes fitted directly to the furnace assembly itself. It is very important to clean or replace the filter on a regular basis to maintain peak system efficiency. A dirty filter reduces airflow causing your system to work harder to circulate the air. This puts unneeded stress on its components and leads to higher energy consumption, which translates into higher energy costs for you. A stressed or overworked furnace system is also prone to mechanical failures and malfunctions leading to costly repairs. Air circulation is achieved by means of an electric fan referred to as the blower assembly. Its job is to draw fresh air into the system and distribute warm, conditioned air throughout the home. A return vent — a large, flat vent located in the ceiling, wall or floor — is the point where the fresh air enters the furnace system and is usually located close by. The heated air is distributed through a series of air ducts and vents connected to the plenum attached to the furnace that channel the heated air to specific areas within your home. The plenum acts as a junction point for both the gas furnace and its adjoining ductwork. Often a square box, it attaches to the furnace on one end, while the ductwork circuit connects to one or several of the remaining five sides of the square. The plenum is commonly fabricated out of galvanized sheet metal, or fiberglass duct board. Some furnace systems incorporate a humidifier, located close to the appliance to mitigate the drying of heated air, which can cause respiratory discomfort. A simple way to look at it is as the air is heated, moisture within the air dissipates. The humidifier replenishes the air’s moisture content that is lost during the heating process to enhance the overall comfort levels within the home. Most humidifiers incorporated into a gas furnace system are connected directly to a water line, which will supply a continuous flow of water to the device. The humidifier should also include a drainpipe to channel any condensation that accumulates during the process to your home’s exterior. Older humidifiers might require that you fill them with water as needed and empty a condensation tray manually. Natural gas furnaces usually have two types of warranty coverages. One warranty covers the heat exchanger & the other covers the main components. Heat exchangers usually have a a lifetime limited warranty or a 20 year limited warranty. The main component warranty you usually see includes coverage on the blower’s motor, furnace igniters, and on all controllers, as well as any other main parts of your gas furnace.